The Puto, Mangga ug Sikwate (Rice Pudding, Mango & Hot Cocoa) served up by the world-traveller Sha of Wanderlust. Who can resist hot chocolate, for breakfast or otherwise? 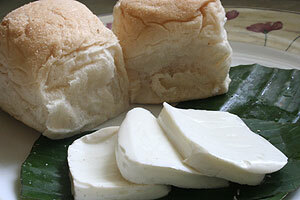 All the way in Greece, her breakfasts brought back memories of her childhood in Cebu. Tuyo! 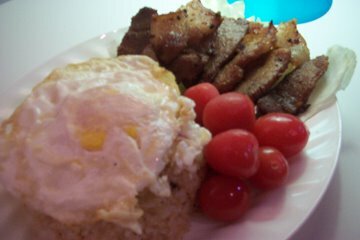 I had to enter with my all time favorite Pinoy Breakfast (longanisa being a close second). I had this delicious salted and dried fish with garlic fried rice (sinangag) and fried quail’s eggs. Suffice to say that it didn’t last long after this picture was taken, as it was attacked by one hungry breakfast-eater! Midge over at Sybaritic Diversions joins Lasang Pinoy for the first time…hooray Midge! Just in time for breakfast! 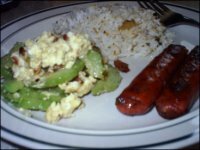 She shares with us her favorite: Tosilog. 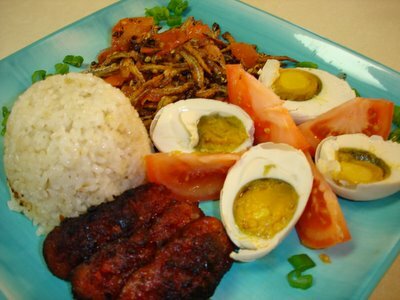 Ah yes, the famous ‘silogs…this one with tocino, fried egg, sinangag (fried rice), and some achara on the side. To top it all off? Kapeng Barako of course! 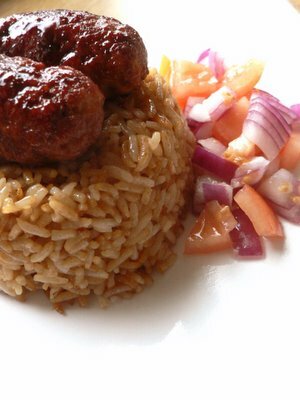 Blogging from the UK, Mae of the luscious Rice and Noodles makes her own Skinless Longanisa. I have never made my own longanisa before…now I must. Mae makes it seem all very easy. Served (of course!) with fried rice and some red onion salsa…yum! Look at those little sausages glisten…such a mouth watering picture Mae! You tempt us all! And over at Pinoy Cook, our very own Connie (aka Sassy same as above) shares this delicious looking Potato Omelet. A dish she learned from her father and now enjoyed immensely by her kids. Hmmm, I would enjoy it too! 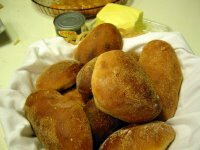 Ces of essenCes expertly prepares another version of our famous ‘silogs…Pusitlog! 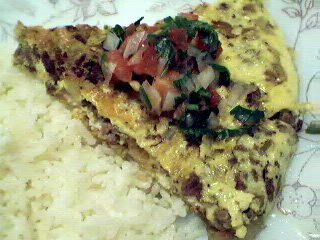 Another entry recalling sweet memories of breakfasts past prepared by mom 🙂 Served with tomato omelet and sinangag cooked, not only with garlic, but also with scallions and bacon (YUM! )…and to drink? Coffee with whipped cream and cinnamon, and orange juice (a delicious little twist on tradition). 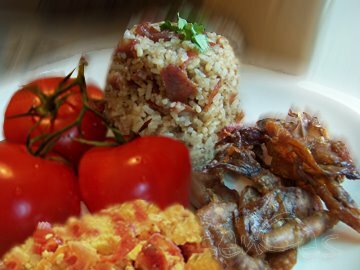 Angelo from Saskatoon, Canada puts together a tempting spread of dilis and dried pusit (squid), with garlic fried rice and itlog ensalada (a salad of tomatoes and egg) on his blog Eat Matters…with a few tips on keeping the fishy smell (from frying our dried delicacies) at bay. He also adds another entry for Lasang Pinoy (Lasang Pinoy 7.01) of Pinamalhan (how industrious! )…check it out! 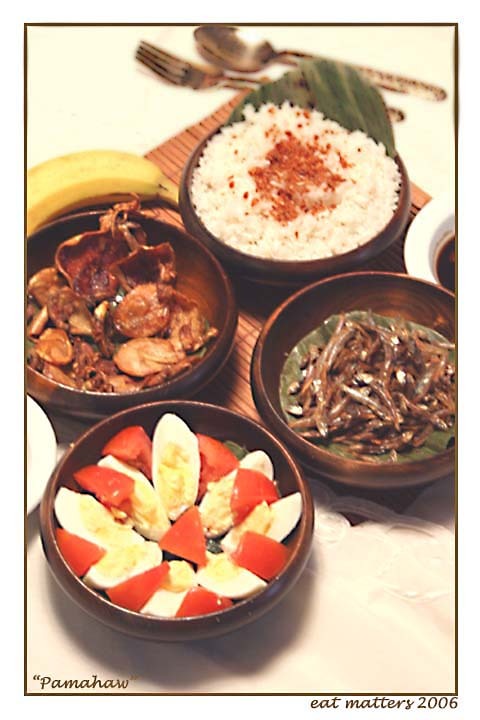 CJ, in the USA, of CJ’s Food & Discovery (now CJ’s Food Fantasy), puts together another ‘silog: longanisa, dilis, fried rice, and itlog na maalat (salted egg). A complete breakfast! What should we call this CJ? Longdilisilog? 🙂 Any way you call it, it spells a delicious almusal! Back in the Philippines, in Quezon City, Lani of Chibog Chicka Lakwacha ATBP blogs about eggs and the roles it plays in various Pinoy breakfasts. 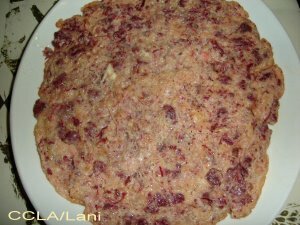 Aside from featuring a couple more ‘silogs, she also whips up a corned beef omelet, which she likens to tortang giniling, and is a favorite of her son. 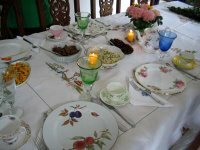 Kai in Pangasinan, of the sweet blog Bucaio, tells an enthralling tale of her family’s chocolate-making history. 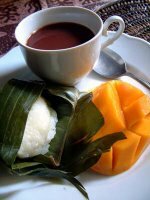 The perfect story to go with a decadent cup of hot Tsokolate. 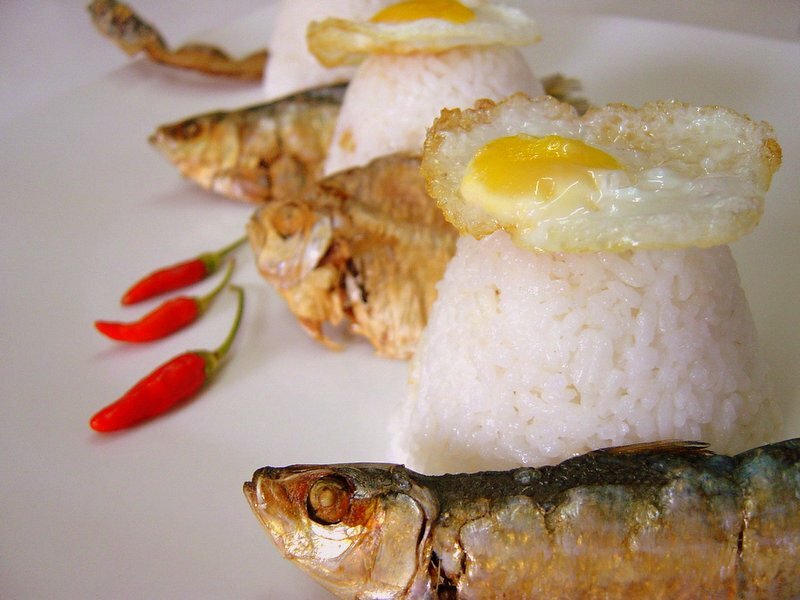 The perfect Pinoy breakfast for the sweet tooth in all of us. Kai, I was transported by your story! Stef of Stefoodie.net get inspired and prepares a Trio of ‘Silogs. I had some problems uploading a picture but let me assure you the pictures will have you drooling so check them out! 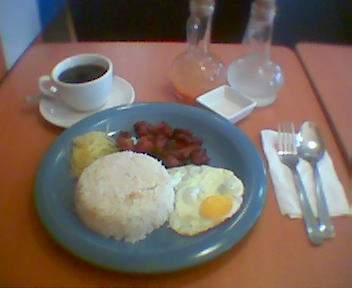 Stef prepares tapsilog, longsilog, and tosilog for her little black-belters after big tournaments. Mila at Watergirl (my first entry!) 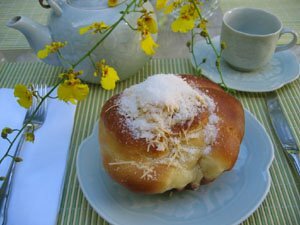 give us a list of heavenly breakfast foods as an answer to the hypothetical question: “What would be your first meal in heaven?” It is a heavenly list indeed so please do not read when hungry lest violent tummy-churning occurs. I love how she refers to tsokolate…”dark, bold tsokolate ah/eh/i/o/u“. When I was in the Phils. my favorite breakfast is tortang itlog and kamatis, longanisa , tinapang bangus, rice and of course coffee. 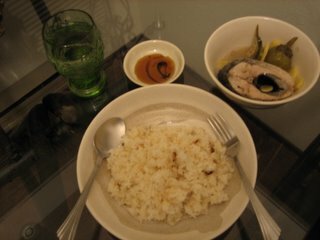 The thing is I don’t drink the coffee, I pour it over my rice(plain boiled rice not sinangag but I guess you can use this, too). 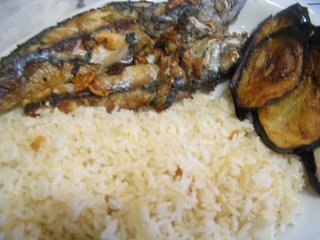 Yes I “sabaw” it in my rice. 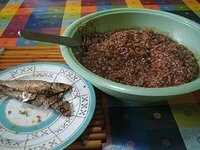 I really love this combination of coffee, rice and eggs with tomatoes, tinapang bangus and of course longanisa or langonisa as I call it. 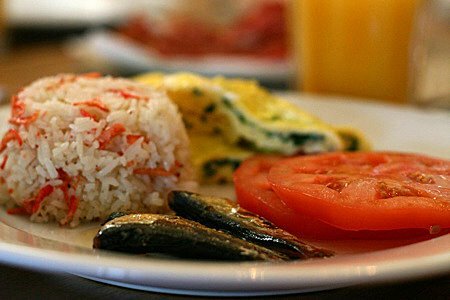 Mike of Lafang shares with us a wonderful breakfast he had at Sonya’s Bed & Breakfast in Tagaytay. The delectable array of food included Chicken Pork Adobo, Mango Salsa with Coriander, Crispy Fried Pork Adobo, Garlic Fried Rice with Daing (dried salted fish), as well as rich Chocolate Eh, a perfectly made Omelette, fresh ripe mangoes, and Hispanis (or Spanish) bread. 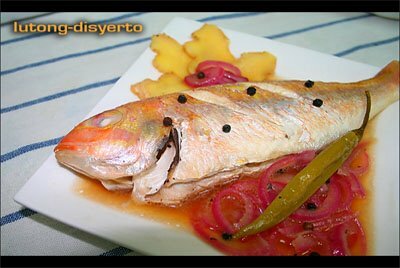 From Lutong Disyerto we have Paksiw (pickled fish or fish cooked in vinegar) with sinangag (garlic fried rice). A great looking repast and another favorite (see Kusinera Wannabe’s entry above). Another new entry! Mirsbin’s Kitchen shares with us some Champorado and Tuyo…another well loved favorite! So go over there and check out her “Ado at Away” story…. great round-up! 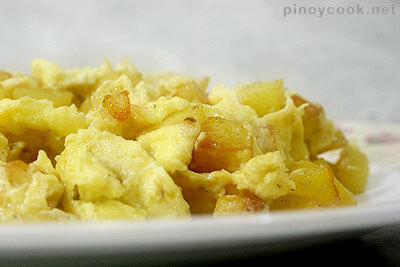 was looking for Pinoy breakfast varieties and realized that one particular home-cooked dish that i missed. a plain omelet, then topped with a small can of beans (the kind we are sooo familiar with-pork and beans na halos walang pork), let simmer for a minute and serve with sinangag or fresh rice and another dish of choice like native sausages or daing! this is a hit with kids who love the sweet tomato sauce flavor of pork and beans. 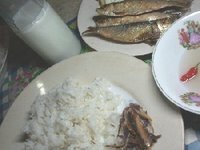 ginutom ako lalo. . .